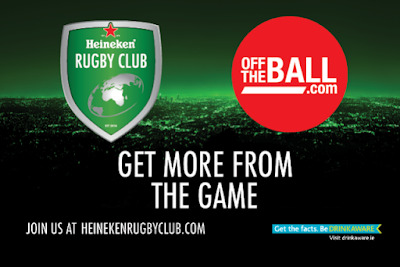 Many thanks to the good folks at Heineken Ireland for inviting me to the live show at the Olympia which involved Off The Ball's Joe Molloy having an informal chat with Brian O’Driscoll, Paulie, Justin Marshall, Keith Wood and Alan Quinlan ahead of the weekend's massive test encounter at the Aviva. In the first part of the show O’Connell spoke candidly of how he feels about going into coaching as well adjusting to life in Paris - for example, they seem to play a lot of Sunday matches which can understandably make for long spells away from family that can bleed into the following week. When it comes to learning the language, he says he's getting there slowly and he probably got his biggest laugh from the crowd when he said he'd watch Charlie and the Chocolate Factory in French to help him along! In the next segment they brought out Marshall so obviously the All Blacks match came into focus. He spoke of how “rugby saved his life” as he was getting into trouble with the law as a teenager and was able to sort himself out enough to make his test debut via an unconventional route without having played schools rugby. You could see by some of his contributions how he got that “trouble maker” reputation…although I have to assume what sounded like a dig at the people of Limerick was unintentional given he was sitting between Paulie and Woody at the time! He did offer one interesting bit of insight… They were discussing the whole issue of ‘how to handle the haka’ and Marshall pointed out that rather than concern yourself over how to behave while it's happening, perhaps teams should focus on getting ready to play as soon after it's over as possible, since it does involve a lot of concentration for the players and they have to regroup to get back to match readiness. So if we win the toss I say we take the kickoff! Anyway it was a great night overall and many thanks once more to Heineken for bringing this humble blogger along, and it was good craic watching with the likes of Joe Sheppard from the Three Blokes A Ball & BOD vidcast and Sean McMahon from Pundit Arena who's name I have typed many a morning for Front Five posts! It was great way to tee up what should be an exciting weekend of test rugby. We have reached the end of the forwards in our weekly journey through the 15 green jerseys, and for this one I'd like to highlight a skill that for some reason doesn't get highlighted all that often. Controlling a rugby ball with your feet is a nigh on impossible task when you're standing up, but try doing it when you're leaning forward with your head stuck between the arses of two massive locks and the scrum is moving steadily forward! It's a quirky, freaky type of “tekkers” (hey where did that word go it was everywhere for a while then it vanished?) when you think of it, yet it's one that is critical in the modern game as milking penalties from scrums can turn tough positions on the field into massive territory games and even points on the board. Jamie Heaslip literally burst onto the scene thanks to his rampaging runs with the ball and over the years proved invaluable by other means such as lineout catches, breakdown work and the like, but I always felt this most basic of number 8 skills is often overlooked. Sadly now he has been forced to retire (although so far he seems a natural at his colour commentary role) and last Saturday we saw his natural successor CJ Stander showing his prowess in that area as we needed our scrum dominance for all three tries in our otherwise substandard showing against the Pumas. But in general CJ is more about the ball carrying, ad there's no better man for finding the hard yards. Despite the dearth of back row talent at Joe Schmidt's disposal, I reckon it would take a lot to shift him from his ideal World Cup XV at this stage. That said, Stander does have a certain Jack Conan snapping at his heels. He has no difficulty finding metres after the tackle either and is particularly good in open play, both with pace and finding support runners with offloads. You'd have to be confident starting either n Japan to be honest. After them you have the versatile back rowers who can slot in if required…I have to mention Sean O’Brien in this category but I'd be afraid to say much more for fear of jinxing his already dreadful luck even further. Next there's Rhys Ruddock and Jordi Murphy, both well capable of ‘coming in and doing a job’ as the saying goes. Max Deegan has shown signs over the past season or so that he could be one for the future, and again at Leinster Caelan Doris was one of the few positives Ireland took from June's Under 20 World Championship. 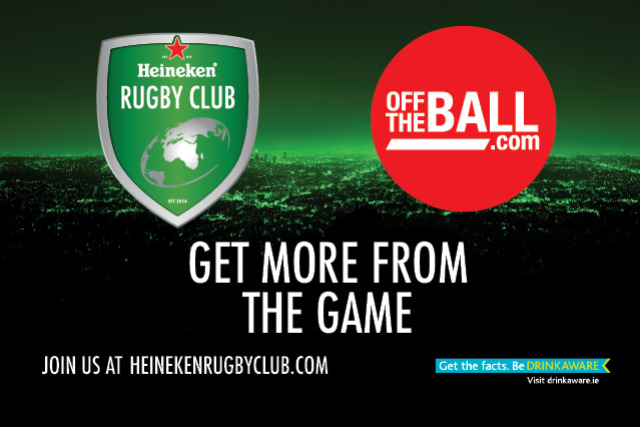 6N PLAYOFF OR 7N AUDITION? One of the reasons Conor O'Shea sent a relatively under strength Italian team to play Ireland was that he was prioritising last weekend's clash with Georgia in Florence, and it proved to be a wise move as they recovered from the Chicago shellacking to beat the Lelos 28-17. But over the years, and I mean over many many years, there has been an ongoing debate over whether or not to make changes to the format of the Six Nations, with the ‘Six’ being the primary target. After first Italy in the Northern Hemisphere got added to the top tier, then later Argentina in the South, are there any more nations worthy of a boost? At one time you might say Romania was next in line but over the past decade Georgian rugby has come on in leaps and bounds (or should I say ‘binds’ since they have a particular penchant for producing props). Broadly the debate is in two camps - those who feel the tournament has and always will be ‘fine as it is’, and those who want change, not just for the sake of it, rather than to benefit the growth of the sport in more places. If change were to happen it could do so in two ways - either by adding a team and making it a '7 nations' or introducing some kind of promotion/relegation system with the B championship. Personally, I would go for both. A 7-team round robin would take 7 weeks and we already have that many in the calendar for the 6N. Countries would just have one less off week but if that extra match were against Georgia they'd surely be using the fringes of the squads anyway. I'd still want the other countries to have a chance to step up by way of promotion, but at first I'd make it difficult by way of a one game playoff hosted by the bottom team in the top tier. But there's one final caveat to my suggestion…it wouldn't happen right away. First I'd like to see countries hoping to rise to the top table add a team each ‘Jaguares’ style to the Pro14 to get used to week in week out rugby. For me the need for that last part was illustrated in the match in Florence. The Georgians showed plenty of ability, of that there was no doubt, and not just in the forwards either. But it was the little niggly areas of the game where Italy held sway, and most of us can remember a time when whey were the ones with the shortcomings. So maybe before we look at adding American or more South African sides to the competition, maybe we could look within our own continent first? Tbilisi Caucasians anyone? Or, we can just keep things as they are for another decade or so, happy that at least they were willing to introduce the bonus point to make some kind of change. Last week I harped on an online bru ha ha over Luk Fitzgerald's commentary skills, or according to some, lack thereof. One commenter put forward a suggestion that since he's a fluent Irish speaker, maybe he'd be better suited to TG4? This put me in mind to address my opinion on the channel and its coverage of rugby over the years. It has been quite a polarizing topic and I'm hoping I can find some kind of middle ground because that's where my views have always been. I don't fully understand why complaining about commentary in Irish means you disapprove of the language itself? Sure, maybe some online comments go OTT by some who were traumatised by Peig Sayers in their schooldays, but opinion on the language itself shouldn't really be the issue here. So back to rugby. I have no problems watching matches on TG4 and presentation-wise Máire-Treasa & Co do a great job. I can even follow a portion of the commentary, especially since its a sport and thus there's much repetition of certain phrases (“cic álainn!”). But make no mistake…if there was an English commentary option, I'd take it. And I know I'm not the only one by a long stretch. I have absolutely no polling data to fall back on here but I'd say I could safely use the words “vast majority” for this. Which means that if Luke wants to make a name for himself in the punditry game, I can totally understand if he chooses to do so in English to reach a wider market. It's not me being against a language, rather being focused on reality. Another area of constant debate in rugby where I try to stay in the middle is attitudes towards soccer. Unfortunately egg-chasing fans still report to the old put downs of calling it ‘wendyball’ and other such demeaning names, for example. But by contrast, the game of rugby itself often goes out of its way to copy names, systems and formats from the round ball code. English rugby has a Premiership and a Championship, for example. And when the ‘big changes’ were made to the Heineken Cup, a lot of the features were added that resembled those used by UEFA's Champions League, like sponsorship structure and the anthem. While I do appreciate watching a decent game of football when I have the time, I only grudgingly accept mimicry such as that outlined above. They are completely different sports with completely different demands on players and perhaps even different expectations of fans so just because something works in one doesn't mean it will for the other. But while I'm willing to look the other way for most things, I reckon I have found one where I have to draw a line. Rugby refs should never, ever, ever, wear black. It's just not right. End it now please. At least Wayne Barnes won't have one at the Aviva this Saturday, although if the match goes as many have involving New Zealand, he could be accused of wearing one!